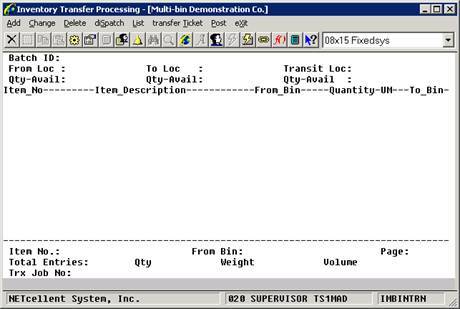 The Inventory Transfer Processing is used to transfer product from one location to another, but can also be used with Multi-bin to transfer product from one bin to another. This is an integral part of the Multi-bin two-step processing. Items are received into a receiving bin and the transfer process is used to assign a stocking bin for the item and complete the transaction. This eliminates the accounting office from assigning bins since they are usually unaware of the bin status in the warehouse. You can add, change, delete, dispatch, list or post a transfer batch. A transfer ticket can also be printed from here. · Job Number in Multi-Bin Inventory is optional. Currently if the user is using Job Number, it will be written to the Bin Inventory file. However, not everyone wishes to do so. They may want to use Job Number for a different purpose, without linking to Bin Inventory. Therefore, in Multi-Bin Global Setup, we introduced a flag “Write Job Number to Bin Inventory File?”; Y/N. The default is “Y.” If ”N,” then “STOCK” is always written to Bin Inventory. · Job Number is added to the Transfer Batch File and the Transfer Trx File. The Job Number in the batch header serves as a default and will be displayed in the Batch Detail Window and in the Inventory Transfer Add, Change & Delete screens on the top line beside the Batch ID. · The Job Number in the line item is the actual Job that will be used. By default, it will use the header Job Number, unless inventory does not exist for that Job in that bin. · If there is not enough quantity for the “Job” or “Stock,” then by default we offer to create a new transaction for the remaining quantity. · An “*” will be displayed beside the “From Bin” if the “From Bin” Job Number is not the same as the Batch Header Job Number. To see the Trx Job Number, highlight the line and it will be displayed at the bottom of the screen. · When using F7 to search for Bin Number, it will display both Bin# and Job#. The returned Job# will then be used. Again, if there is an insufficient quantity for the Bin/Job combination, then we offer to create a transaction for the remaining quantity. · Once the Job Number is entered in the Batch Detail Window in Add Mode, the user is not allowed to change it. · The system will allow batches with different Job Numbers to consolidate since it only matters at the transaction level. · When posting through PO, the batch header job number will be “STOCK.” The transaction’s Job Number will be the actual Job Number (either entered through the Bin window – regular receiving, or PO line item job number – warehouse receiving). · When posting through IM receiving, the batch header job number will be “STOCK.” The transaction’s Job Number will be the Bin window Job Number. · COP will have the same Batch Header Job Number in the Order Header. The Line Item Job Number will be blank since the From Bin is blank. · The BOMP Job Number is from the WO for both the component and parent. · The Job Number will be “STOCK” if the previous flag is set to “N.” When the previous flag is set to “Y,” then it still defaults to “STOCK,” unless the user manually enters it or if there is a Job Number in the PO Line Item, the Sales Order Header or the BOMP WO. Then the Job Number will be written to Batch Header.